Got this letter in the mail while I was in the hospital for the Big Dig, aka reconstruction. I don’t even know what to say. As you lovely readers know, I usually have a lot to say, about a variety of topics, and one of my favorite things about blogging is being able to blab away about whatever tickles my fancy at the moment. Sometimes silly, sometimes ticked off royally, sometimes serious, but rarely speechless. But this letter is definitely unusual. Now I’m not dogging Methodist. I’ve had most excellent care there on all of my visits, and I don’t for one second take for granted the supreme luxury of having such esteemed medical care right around the corner (Sugar Land) and a short hop down the toll road (Med Center). I know that people come from far and wide to seek care at the places that are easy drives for me. So let’s be clear that I’m not dogging Methodist. Love that. 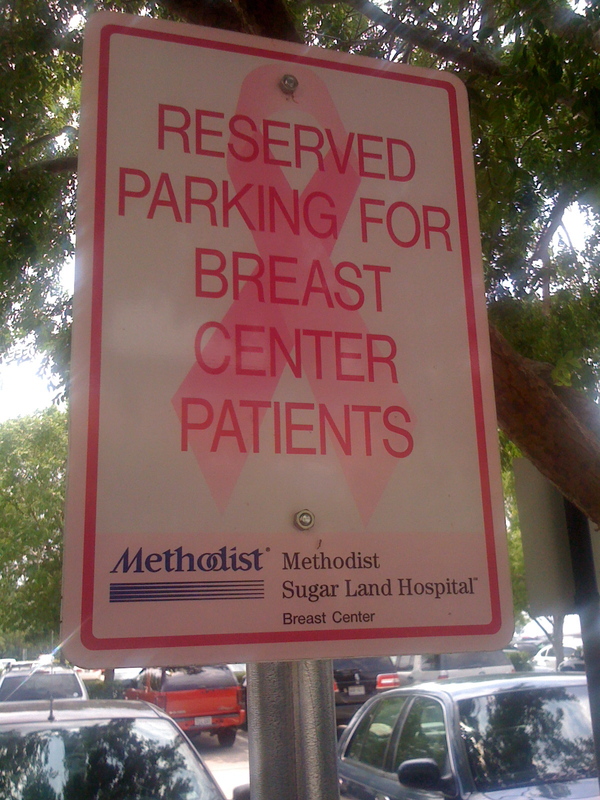 Hell yes, I should get special parking, right up front, at the breast center. Even though until just a few days ago I had no breasts, I still liked the special treatment that Methodist SL affords its breast care patients. Wish the grocery stores and Target would follow suit. I know, I know it’s a terrible picture. The iPhone camera stinks, but it’s convenient, and let’s remember, people, that I am 5 days post-op here, with 6 JP drains sprouting from my body, and today was my first day without any pain pills, so keep your comments about the shoddy photography to yourself. This is not a photography blog, after all. I probably shouldn’t even be typing yet, but I’m dedicated to bringing severe belly laughs to you, my lovely readers, so you’re welcome. 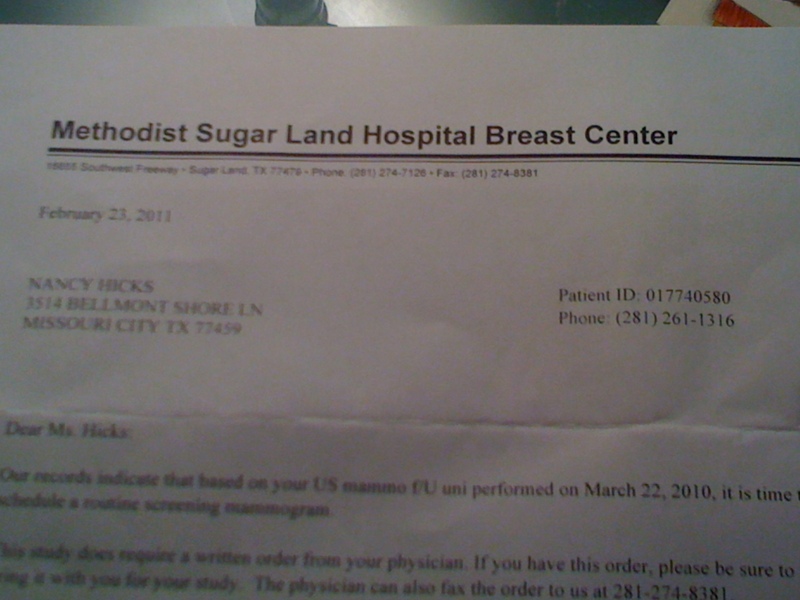 Since it’s such a shoddy photograph, let me reiterate the juicy parts: The Methodist Sugar Land Hospital Breast Center’s records indicate that based on my US mammo f/U uni performed on March 22, 2010, it is time to schedule a routine screening mammogram. Oh, you mean the mammogram last March that set off the chain of events, preceded by my annual well-woman exam, that led to me being diagnosed with breast cancer at age 40? That mammogram? And that I should contact Methodist Sugar Land Hospital Breast Center at 1-800-HOW-STUPID-IS-THIS to make an appointment, and they thank me for my cooperation. On one hand, it’s nice that the MSLHBC is so on top of things as to remind its patients that it’s time to come in for the good old smoosh & squeeze. Lots of women need reminders, and the hospital certainly should not be tasked with knowing I don’t happen to be one of those women. On the other hand, it’s pretty hilarious and utterly ridiculous. And scary, too; don’t forget scary: the idea of anyone touching my newly sculpted chest, much less putting it through the greatest flat iron ever, makes me very, very afraid. Thank you, Methodist, for the reminder. I will get right on it. I shared with Bonnie right after dinner. My introduction to your email was this “it doesn’t happen to just us” … Bonnie sat down and a few moments later we were laughing at the entire system – or at least what we know about it. … “the greatest flat iron ever” … too funny. I hope neither of us, spouses included ever have to dial 1-800-HOW-STUPID-IS-THIS … EVER AGAIN. Sounds like your sense of humor received a great check up today. Paul, Bonnie, Taylor, Logan & the Lu-Dog!! Nice. Really nice. Talk about the left hand not knowing what the right is up to! Thanks for dragging your drain-spouting carcass to the keyboard to bring us another belly laugh. Your comittment to your readers is impressive. I am speechless! Shocking, I know! It’s funny and a little sobering also to think that one department in the hospital treating a certain body part doesn’t seem to be aware that another department lopped it off last year. As a result of their own screening by the way. It’s extremely difficult to get both your computer systems and more importantly your meatspace processes figured out to avoid this kind of thing. Fortunately we just get a chuckle, no real harm done here. I think the larger point is that nobody cares as much about your condition, treatment and care than you do. 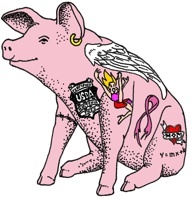 For anything even moderately serious you and, since you will be drugged up half the time, your posse or handlers or loved ones, whatever you call them, need to be on top of the data, the diagnosis and the treatment plan. And if there’s more than one doctor or hospital involved you have to that much more vigilant. Check everything, make sure it all makes sense. This is not an indictment of any individuals or institutions, it’s kind of the nature of the beast given how our medical industry is structured organizationally, legally and financially. Briefly on politics, this is the central point of what disappointed me so much about Obamacare – rather than fix these issues it entrenched and perpetuated them. There simply is no single person in the system that is responsible for your total well being. Instead we have lots of people – doctors, nurses, etc each of whom are responsible for a few specific things. One of the great things about our health insurance coverage was the assignment, immediately after the diagnosis in fact, of a nurse that we have talked to many times over the phone. Primarily she has handled all of the crazy financial and billing issues that have arisen. But she lives in California, she’s not there to look after us in the hospital or the doctor’s office. So the bottom line is, if you are unfortunate enough to receive a diagnosis such as breast cancer, please do yourself a favor and read, research and inform yourself. Intelligence is a far better predictor of health than quality of insurance. I’m very confident that being informed and in control of your own total treatment and care will result in better outcomes. It’s worth the effort.